I was sitting down to watch the Auburn-Ole Miss game in the tasting room when I realized Little Fridge II hadn’t had any visitors lately. It has been running and running and no one has paid her any attention. I realized I better drink some of the brews in there before I have candidates for the malt vinegar I’m thinking of making. 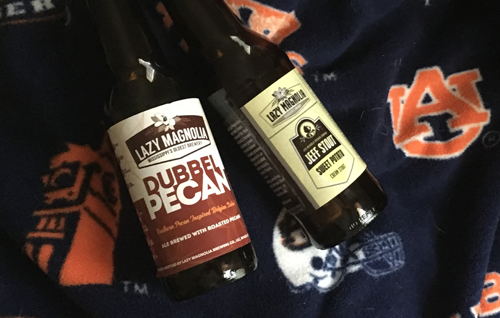 I came across two Lazy Magnolia brews: Dubbel Pecan and Jeff Stout Sweet Potato Cream Stout. I’ve always like their Southern Pecan brew. Very southern especially since they are Mississippi’s oldest brewery. And considering we are playing Ole Miss I thought it appropriate to drink. I picked up both from Wine World, the Dubble Pecan just recently, the Sweet Potato Stout —–hmmm—- some time ago. I started with the Dubbel Pecan. The label says “Southern Pecan Inspired Belgian Dubbel.” It has a smooth lush start. Then a dry finish with a hint of Belgian sugar on the tip of the tongue. To get in the mood I was drinking it out of my Yeti can holder. Of course I was wearing orange. It starts off more pecan than Belgian. But as it warms up the flavors start to blend nicely. They recommend serving at 55 degrees. I started out more around 40. Their pairing recommendation is with steak, ribs, milk chocolate and bread pudding. I didn’t try it with anything. I was too busy cheering on the Tigers. I like this brew. Only 15 IBUs and is a reasonable 7% ABV. But at 2.99 a bottle I won’t pick up a bunch of singles. If I find it on tap though I will not hesitate to get some. Auburn was winning so I decided to go for the Potato Stout. The Pecan Dubbel has a clear bottling date (March 2017). The Potato Stout? No clue. The label has changed since I bought this brew. So I got no clue as to how long it was sitting on the shelf before I bought it. I know it’s been in the Little Fridge for at least 6 months. Pours with a nice dark brown head. The coffee stout part jumps out at you. There’s a bit of sweetness but it’s knocked down a bit from the dryness of the coffee. Very dry mouthfeel. But I have to wonder if any of these nuances are from it being old. If age has shifted the flavor profile I’m okay with that. It’s a good brew. I like dark brews. I like coffee stouts. 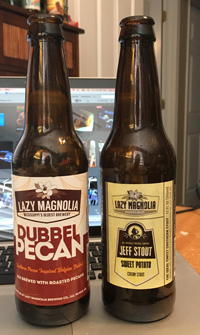 Now that Lazy Magnolia has started datestamping their beer better I’ll have to keep an eye out for a newer bottle to try.